Bring slow-moving car to a stop by thrusting urethane wedge several times in front of the car wheel. With each thrust, some of the forward momentum is absorbed. The wedge will hold the wheel temporarily until a steel wheel chock can be installed. 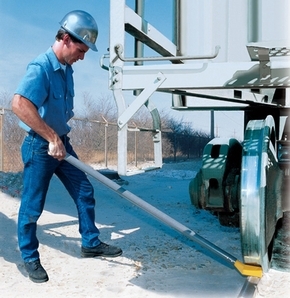 A useful means of car control when moving freight cars with a car puller.